Happy Friday! Seems like Old Man Winter is itching to get going this year. I heard today of the passing of Roy Clark. 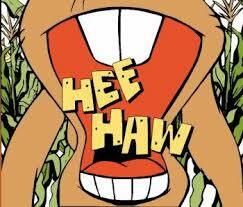 I will admit that I watched Hee-Haw, in fact I watched it a lot which may explain several things. But anyway, it brought to mind all the jokes and skits I saw on Hee-Haw. One of my favorite that I have always remembered was Archie Campbell’s spoonerism of Cinderella that also featured Roy Clark. So here is the script of Rindercella as well as a link to watch the Hee-Haw clip. Enjoy and don’t forget to slop your dripper! Now Rindercella’s mugly other and her two sad blisters, they went out to buy some drancy fesses to wear to this bancy fall. But Rindercella couldn’t go because all she had to wear were some old rirty dags. When Rindercella arrived at the bancy fall, this prandsome hince met her at the door because he had been watchin’ all this time behind a wooden hindow. And Rindercella and the prandsome hince nanced all dight. And they lell in fove. And all at once, the mid clock struck night. And Rindercella staced down the rairs, and just as she beached the rottom, she slopped her dripper! So, the next day this prandsome hince went all over this coreign fountry looking for the geautiful birl who had slopped her dripper. Finally he came to Rindercella’s house. Well, he tried it on her mugly other and it fidn’t dit. Then he tried it on her two sigly usters and it fidn’t dit. Then he tried it on Rindercella and it fid dit. It was exactly the sight rize! So they got married and lived heverly after hapwards. Now, the storal of the mory is this: If you go to a bancy fall and you want to have a pransome hince loll in fove with you, don’t forget to slop your dripper! This entry was posted in Friday Funny, Humor, Uncategorized and tagged Rindercella on November 15, 2018 by Leonard.